Hello! Today I have a graduation card to show you. One of our friends' son recently graduated from the ASU School of Engineering, and this is the card that I made for him. 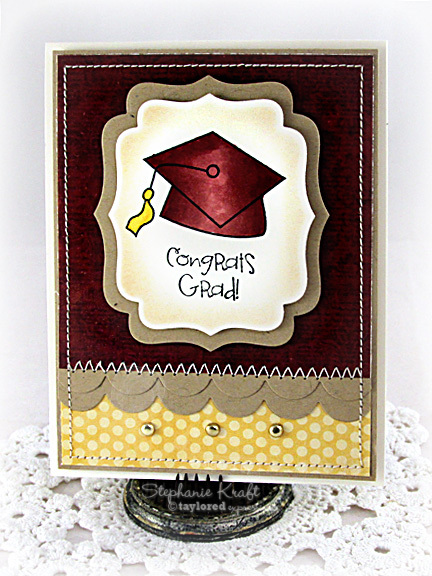 I used the graduation cap image from the super versatile set, Oh What a Day! My patterned papers are a mix from Simple Stories Year.o.graphy (burgundy) and My Mind's Eye Collectable "Notable" (yellow gold polka dot). I used Jen's Deconstructed Sketch #89 for my layout. Accessories: Taylored Dies: Labels Stacklets 2, Medium Scallop Border (Taylored Expressions); Markers (Copic), Gold brads, Foam tape, Thread, Sewing machine. Awesome grad card, Stephanie! 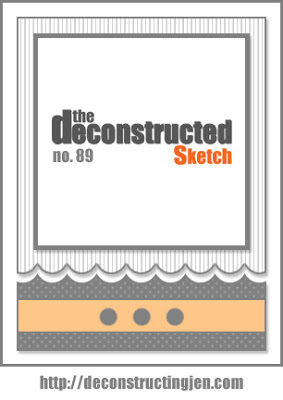 Love the sketch too!